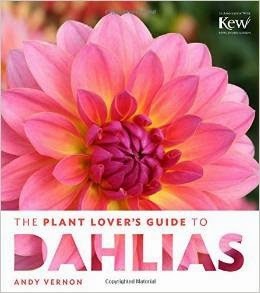 Until I received a copy of The Plant Lover's Guide to Dahlias by Andy Vernon, I never knew there were so many varieties of this plant. I love that the first chapter of Vernon's book is devoted to using Dahlias in the garden. 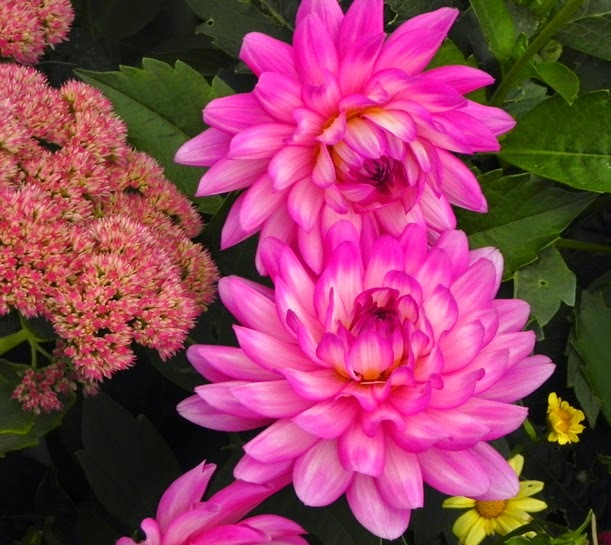 It's one thing growing a plant that demands attention -- and Dahlias are certainly in this category -- but integrating it into an established garden requires a bit of thought and staging. The Inn on Mackinac offers a small Dahlia display. This section of The Plant Lover's Guide to Dahlias offers lots of suggestions for Dahlia companions -- plants that don't steal their thunder but complement their colors and forms. Vernon's photos offer up some inspiration, but if you live in the Midwest, you might consider going with some of his other recommendations that aren't pictured at Great Dixter, a garden in Sussex. Unknown pink Dahlia with Sedum and a small yellow daisy. 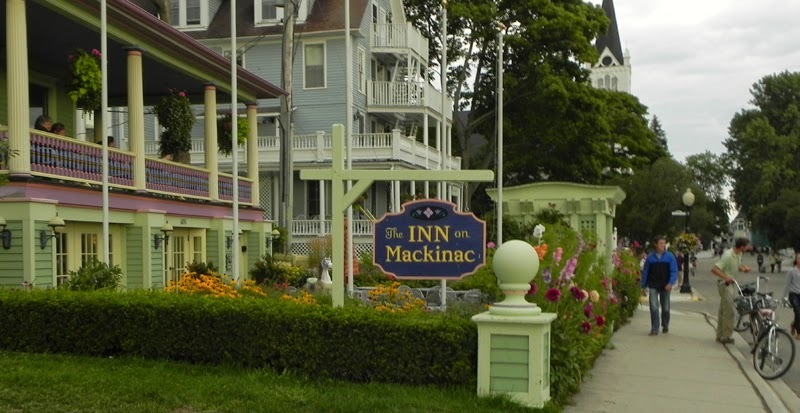 Last year around this same time, I visited Mackinac Island, and snapped some photos of Dahlias cavorting with annuals and perennials in front of the Inn on Mackinac. Whoever does the gardening around this historic home turned inn. Anyway, if you want to see Dahlias playing well with others, this a good place to start. As you can see from my tangent, The Plant Lover's Guide to Dahlias definitely drives inspiration. Besides looking back at last year's photos, the book had me looking online for more Dahlias I could add to my garden next year. Unknown Dahlia with annual geranium and Cosmos. There were plenty of named examples, each accompanied by gorgeous photos and descriptions of the flower type, height and spread, along with growing recommendations. For example, a variety called 'Classic Swanlake' is a peony type that grows just 3 feet tall and does well in a container. 'Bumble Rumble' is an adorable Collerette type that grows 42 inches tall and works well in containers. It, and several of the varieties listed in The Plant Lover's Guide to Dahlias, are available at several suppliers, including many of those I found listed at this great Dahlia resource called The Big List, compiled and kept up by the Colorado Dahlia Society. So with all the online resources about Dahlias, why do we still need books? One reason is that books published by well-known horticultural publishers (one of which is Timber Press) have been vetted for accuracy. Another is that, with a well-organized book like The Plant Lover's Guide to Dahlias, you can find nearly all of what you need about the plant inside its covers. 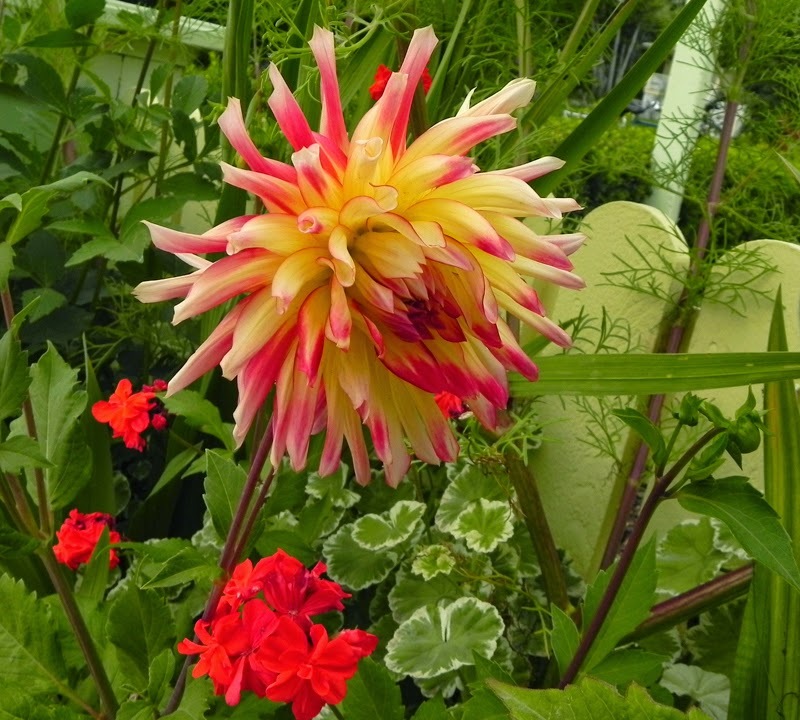 That includes how to design with, grow, propagate, store and choose Dahlias for your home garden. Add to that 200 varieties pictured in gorgeous color, plus a section on cutting and arranging for indoor decoration, and you have the perfect carry-around floral eye candy you can refer to any time. I like to keep The Plant Lover's Guide to Dahlias on my dining table to page through while I eat. Although I am not sure where to find it, I'm sure there is a study that proves that looking at pretty things while eating aids digestion. And there are usually napkins handy in case you over-salivate.